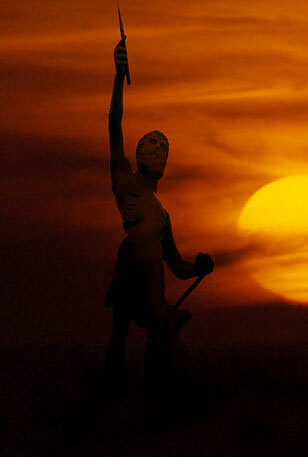 Birmingham ore was used to cast Vulcan (the Roman god of fire); largest cast-iron statue in the world: photo © Duncan McKinnon on Flickr (used by permission). In 1904, Birmingham ore was used to cast a statue of Vulcan (the Roman god of fire), which now stands at the top of Red Mountain in Alabama. Vulcan is the largest cast-iron statue in the world (standing over 5 stories high), and the second largest statue in the USA - second only to the Statue of Liberty (made of copper and steel). NASA's Mars Global Surveyor (MGS) spacecraft detected large deposits of hematite near the Martian equator ln 1998. Scientists believe this adds to evidence that there was once water on Mars. 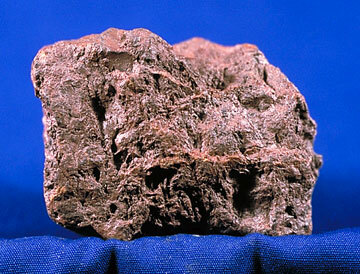 Hematite (iron oxide, or rust) is a common mineral - most red coloring in rock is caused by small amounts of hematite. "... hematite, sometimes called "bloodstone" by jewelers... is composed of 70% iron ... 5% of the Earth's crust is composed of Iron. The inner core of the Earth is believed to be a solid iron-nickel alloy (it's also believed that iron-nickel meteorites represent the earliest material - formed at the beginning of the universe). The human body is 0.006% iron! 98% of mined iron ore is used to make steel. The remaining 2% represents a variety of other uses including inks, magnets, plastics, medicine, cosmetics, and jewelry." Photo © Mineral Information Institute: Hematite (used by permission).